When Arthur angers the ancient Disir, their fury rains down on Camelot, leading Merlin to make the hardest decision of his life. A dark cave, three elderly women pointing at the pool inside the cave and then one of the women hands a massive coin to a man waiting outside with the chilling words: “You have the fate of Arthur Pendragon in your hands.” The opening scene of The Disir is hauntingly similar to that of Macbeth, even down to the three “weird sisters”. The whole episode deals with fate and destiny and whether Merlin can help Arthur escape from the swordfight with Mordred which Merlin saw in Arthur’s Bane Part One. However the true backbone of the episode is wrong decisions. 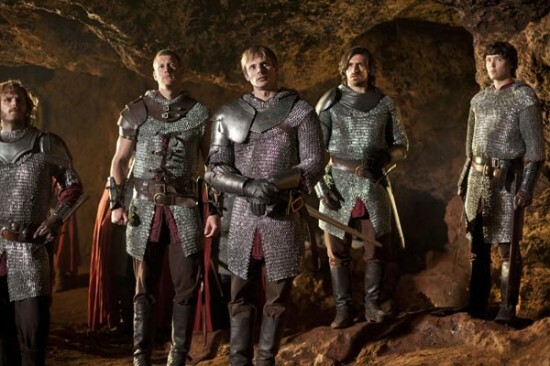 Arthur makes a blundering decision mid-way through the episode when he goes into The Disir’s sacred cave armed this has consequences throughout the episode. However, the worst and most fatal decision of the episode is down to Merlin. Merlin has the chance of a lifetime, he can get Arthur to change his ways and make it so that magic can be practised throughout Camelot once more. However, Merlin believes the consequence of this will be that Mordred lives so tells Arthur to continue persecuting magic. It soon becomes apparent that if Merlin has gone the other way, Morderd would have died. Instead, Arthur’s punishment for his continued persecution of magic is that Morded will live. This decision, I feel, will have far reaching consciences. Colin Morgan is brilliant as the brooding Merlin. Merlin has a very big choice to make; save Morded and have magic or let Mordred die and avert the possible death of him at Arthur’s hands. The emotional climax is in a scene where Arthur asks Merlin for his advice. Morgan excellently portrays Merlin’s moral dilemma with a tear rolling down his eye, he realises that he can’t do what is best for him but what is best for the future of Camelot. It is a poignant scene in a wonderful story. The Disir is a great all round story which very much feels part of an arc that could be leading to Arthur’s doom. I hope that future episodes are up to this standard and that the series will continue with the fantastic character development that we have witnessed so far.